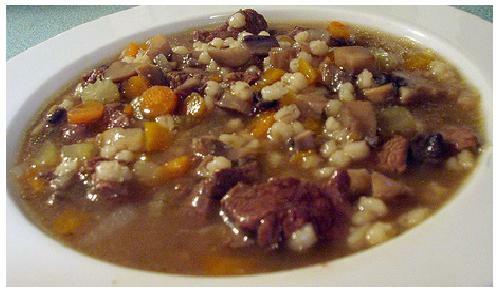 Scroll down for an easily prepared Beef Barley Soup Recipe. Also see the links at the bottom of the page for other popular American style recipes. Barley is a cereal grain that is often used as feed for large animals like cattle, pigs and horses. Among humans, hulled barley is a popular ingredient in soups, stews and bread recipes. It is also used as a base in beer making. 1. In crockpot, layer the vegetables and beef. 2. Add barley and remaining ingredients, except salt and pepper. 3. Cover and cook on LOW for about 8 hours. This Beef Barley Soup Recipe SERVES 8 people. 1. Cut off ends of asparagus stalks. 2. Cut stalks into pieces about 1 inch long. 3. Place in boiling water until tender, about 2 minutes. Drain and set aside. 4. Heat chicken broth to a simmer. Cover and keep warm. 5. Heat the oil in a skillet over medium heat. 6. Add scallions and shiitakes and cook, stirring occasionally, about 3 minutes. 7. Add barley and stir for 1 minute. 8. Add wine and stir until evaporated, about 1 minute. 9. Add about 1/2 cup of the hot broth and cook, stirring frequently, until most of the liquid is absorbed by the barley. 10. Continue cooking, adding the broth 1/2 cup at a time and stirring frequently, until the barley is tender. This takes about 10 minutes. 11. Remove pan from heat and stir in the cheese and asparagus.